No matter where you choose to point your camera and what pictures you decide to take, all your photographs deserve to be looked after. With a photo album from Corban & Blair, you can give your snaps the care they need, and present them in true style. 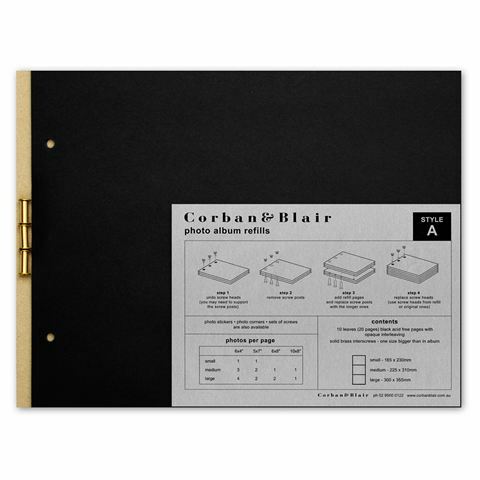 And once you've got your beautiful photo album, if you find you need more pages, that's where the Corban & Blair Photo Album Refills comes in. They include ten leaves (20 pages) of black acid-free pages with opaque interleaving and solid brass interscrews (one size bigger than in the album to accommodate the new pages). Includes ten leaves (20 pages) of black acid-free pages. Solid brass interscrews (one size bigger than in the album to accommodate the new pages).